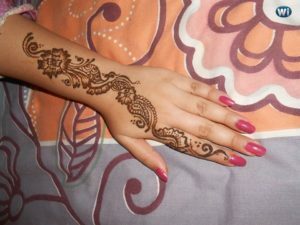 Creating Mehndi designs: What attracts the people in Mehndi they love the pattern and the color. The more intricate design and deep color make you a head turner. 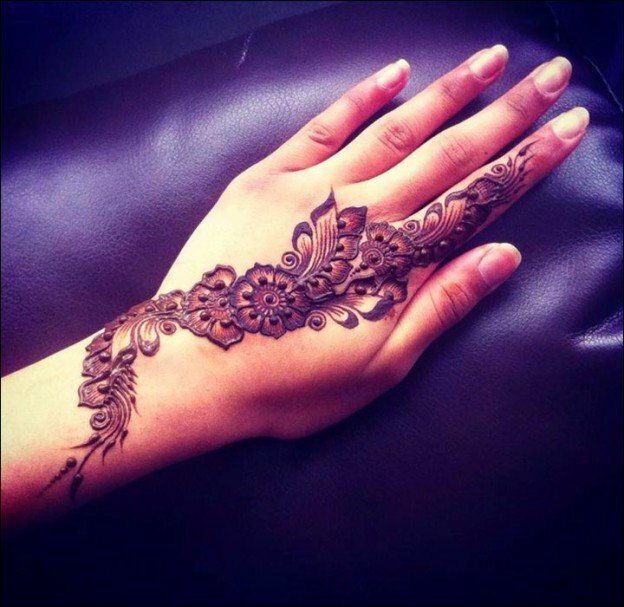 If you are struggling with some stunning Henna design, then this pattern is exclusively for you. 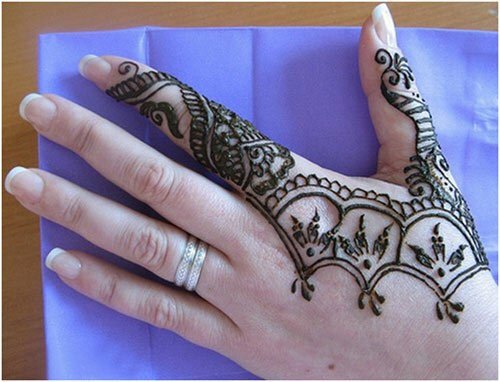 This mehndi design for the hand is easy to make if you start making models from the wrist. Make a sort of bangle at the wrist and make it stand out with small loops that run over its sides. This way create a partition by hand and the arm. At the center of this make a flower with a spiral making two bold lines at equal distance. Once done make four petals making it look like a half flower on each side of the partition. 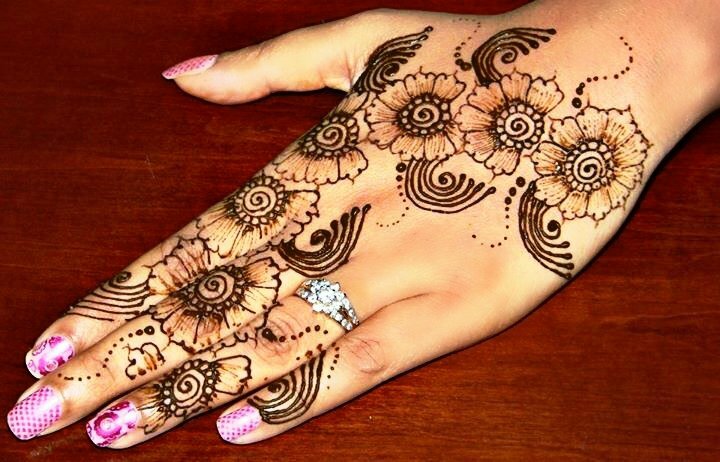 Fill these petals with a little bit of Mehndi. This will make the design look more attractive. Now from every petal start a curved line which holds a twig like leaves and at the same time cover the remaining part of the petal with spiral lines which is again followed by bold loops. From the center, flower makes a C with bold lines. This C should be highlighted with loops, and every loop should hold a dot of henna over it. 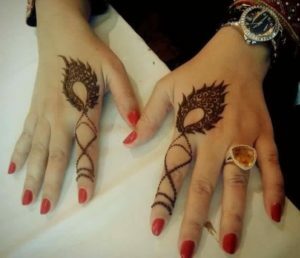 This comfortable Mehndi design proceeds towards the pointer. At the start of the finger make a spiral flower with small twig-like leaves. Make three sheets to each side. This straightforward design will make your finger and hand look attractive. Continuing designing the finger from the upper side, make a small curve towards the right side of the thumb and another curve towards the left side. This way makes few curves on the entire finger. To every curve add loops and small spiral flower with twigs like leaves. Fill your finger with this simple and easy design for hands. It’s an excellent pick for the finger-led functions like ring ceremony. You can never go wrong if you pick this comfortable design on the side to match the compatibility of the dancing partner. This way you beautify your pointer finger. Add zing to your designs by making small patterns at the end of every finger if you wish to do so. At the ring finger, start from the center with two bold lines, thus creating a partition between it. On one side draw a looping pattern, but don’t forget to add a small dot at every loop. 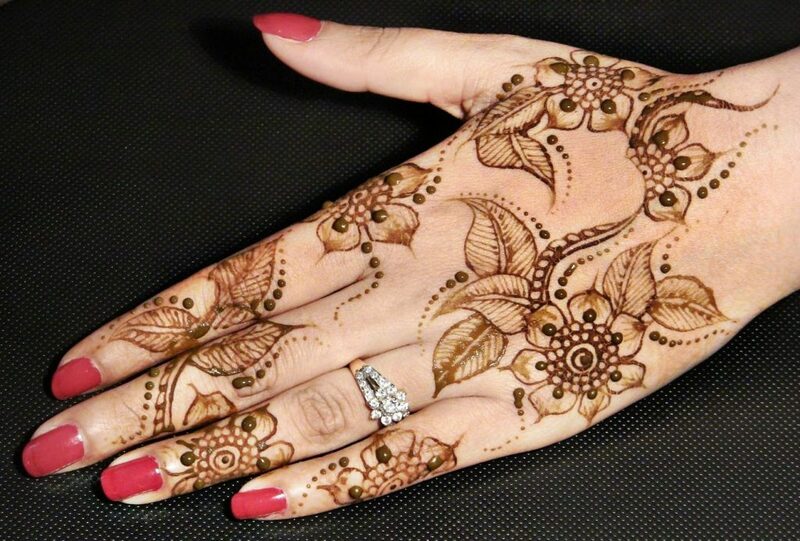 This dot will bring vibrant color to your design so use Mehndi liberally, but at the same time don’t forget to maintain the decorum of the design. On the other side of the line make a slightly curved line to which add a few twigs like leaves. Ensure the pattern is beautifully created with emphasis paid to every minute detailing. For sure, with this design, you are all set to roll over a thousand eyeballs towards you.